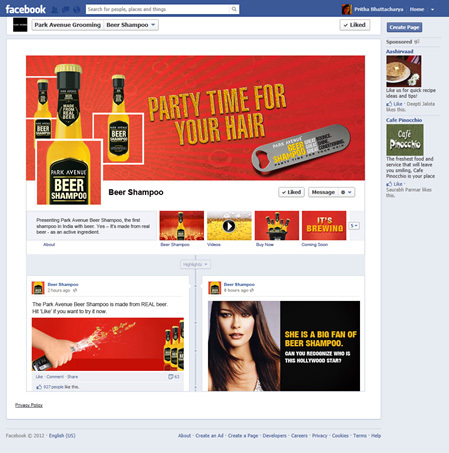 I actually thought this was some kind of a hoax when I saw a Beer Shampoo takeover on MSN India today. But, it is a real campaign. Park Avenue, the grooming major from Raymond, has launched a ‘Beer Shampoo’ in a bid to shake up the male grooming market with a new differentiated product. Targeted at young men looking for new options, the shampoo is supposedly pitched against HUL’s Clear and P&G’s Head and Shoulders. The packaging is also unique as the shampoo container is fashioned as a beer bottle. As long as you don’t take a long swig by mistake, it should be good J as it promises ‘great bounce, shine and conditioning’. The campaign tagline says 'Party Time for your Hair'. But the digital campaign is anything but. The home page takeover on MSN India would constantly auto initiate. On-click the ad led to the Beer Shampoo app on Park Avenue Grooming’s Facebook Page. The app page is styled as a standard Wall/Timeline with posts and cover photo etc. It seems like a bit of a let-down that nothing is clickable and there is no interactivity involved. Considering the media campaign has launched, it would have helped if the landing executions were deeper to keep the consumer engaged. Yup that's right, checked again on another browser and the links are clickable. I guess a browser compatibility issue then. Thanks for pointing out!